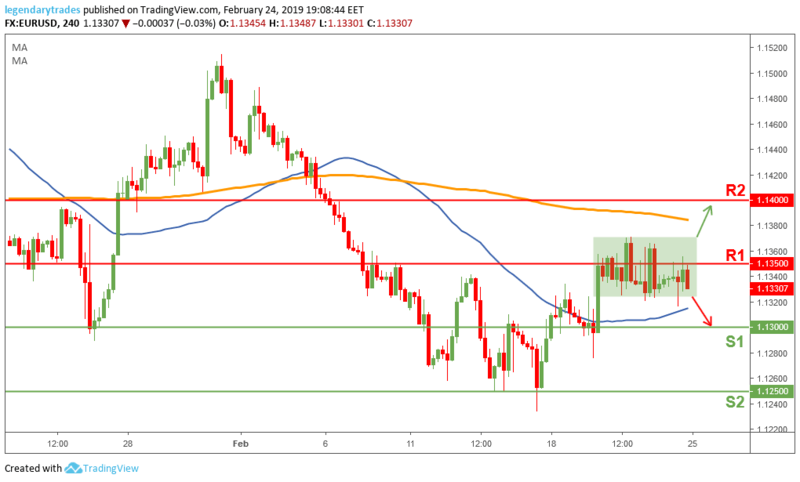 The Euro couldn’t break above 1.1350 for the third consecutive day on Friday, as market sentiment is still mixed and unclear. There are several reasons for this uncertainty. The first reason revolves around the global trade war as no substantial progress has been made. The second and most important reason is the instability of the Eurozone as Germany still struggles in posting any positive economic data and bring about some optimism. However, this weakness is overshadowed by the US as it also struggles economically after the December Durable Goods Orders, the Core Capital Goods orders, Existing Home sales, and the Philadelphia Fed Manufacturing all fell unexpectedly last week. Today is a slow day on the economical calendar front, traders will focus on FOMC Member Clarida’s speech for any developments regarding monetary policy. The Euro is stuck between 1.1320 and 1.1370 for the past 3 trading sessions. The bias remains a bit bearish as price isn’t being able to break above 1.1350 for 3 consecutive sessions. Price will face the 1.13 (S1) support once it breaks below 1.1320. Alternately, a break above 1.1370, will take the Single Currency towards 1.14 (R1) resistance level.